Being able to take a smartphone and then tinker with it to the nth degree is part of the charm of the Android community. Being able to be the best looking, highest spec device on the planet and then put your own, heavily customized or completely stock version of Android onto it is the reason many people swear by Android over its iOS and Windows Phone competition. We’ve flashed more than our fair share of Android ROMs in our time, and we know both how much fun, and how frustrating an enterprise it can be. Which begs the question: if we can find it frustrating, what about people who are less savvy? While it’s true that the average man on the street probably doesn’t have an XDA-Developer account and no doubt won’t want to start flashing things like CyanogenMod onto a smartphone, it’s safe to say that there are plenty of shades of grey in-between them and us, leaving plenty of potentially confused and often scared Android owners. It’s for this exact reason that apps have begun popping up that try to make the flashing of ROMs a less geeky affair, and even the folks at Cyanogen managed to get an app into the Google PlaS store that did just that, which was later pulled for various reasons. Another entry into the arena goes by the name of CustomDroid, and it’s available now. Created by an XDA senior member, CustomDroid can unlock the bootloader on some devices, flash a custom recovery, and finally flash a custom ROM. It can’t currently root the device or flash the required custom kernel, but we hear that such capabilities are currently being worked on. While not all devices are supported, most of the main ones are: Nexus 4, Nexus 7, Nexus 10, Galaxy Nexus, Nexus S, Nexus One and HTC One are all on the list, though there are obviously some notable exceptions. It’s early days though, so we’re willing to give CustomDroid the benefit of the doubt for now. Hopefully in time we will see new devices added to that list, making flashing custom ROMs easier for even more people. Oh, and you’ll currently need a Windows PC to get in on the action. 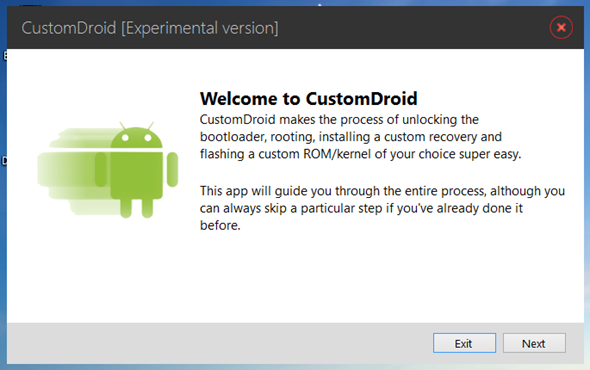 CustomDroid can be downloaded now, and is absolutely free.